The new trail under construction. Image by the author. The Prince George’s County towns of District Heights and Forestville will get two miles of new walking and biking trails, but they aren’t well connected to nearby neighborhoods. A few short links could make them much more useful. 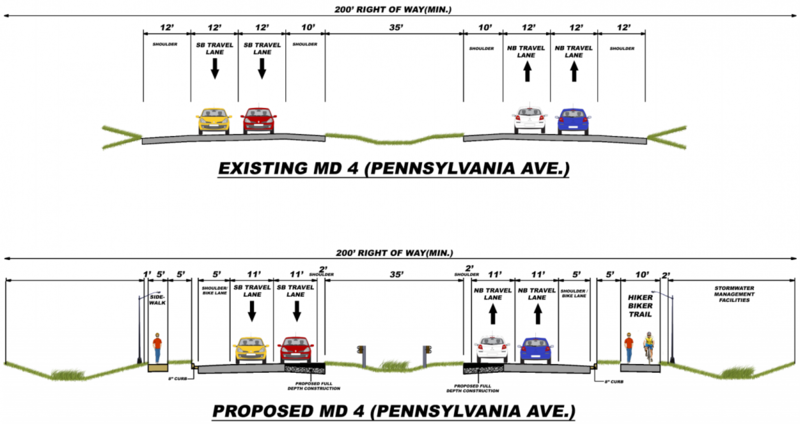 The Maryland State Highway Administration is rebuilding a portion of Pennsylvania Avenue (Maryland Route 4), just outside DC, to improve pedestrian and bike safety. 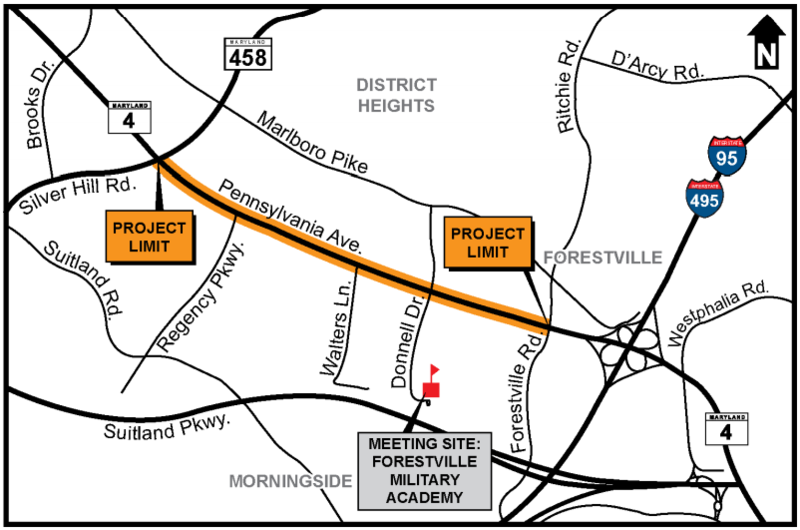 The $24 million project covers a 2.1-mile segment of Pennsylvania Avenue in District Heights and Forestville, which will receive new sidewalks, raised curbs, narrowed lanes, a reduced speed limit, and added lighting. It’ll also add a 10-foot-wide walking and biking trail along the road’s northbound side. Construction on the new project began about a year ago and should be complete in late 2017 or early 2018. Where the trail will go along Pennsylvania Avenue. A cross-section showing the new trail and sidewalk. Images from the Maryland State Highway Administration. Image by Maryland State Highway Administration. This stretch of Pennsylvania Avenue is lined with shopping centers, apartment complexes, and bus stops that attract pedestrian and bike trips. However, it is notoriously unsafe for people on foot. Its high pedestrian collision rate (eight collisions between 2009 and 2011 on a one-mile segment) has already prompted the State Highway Administration to add a mid-block pedestrian crossing, which opened in 2013. While this project will provide great new walking and biking facilities along Pennsylvania Avenue, connections to adjacent local streets maintained by Prince George’s County don’t appear on project plans. Without them, the trail can’t fulfill its potential. Plan drawings don't show connections between the trail and nearby side streets. Image by Maryland State Highway Administration. Connecting neighborhood streets to the new trail will encourage more walking and biking by allowing people direct access to Pennsylvania Avenue and all of the business and services located there. Otherwise, they’ll have to use the same circuitous paths to Pennsylvania Avenue that cars do, or continue using the makeshift paths that already exist in many locations. A “desire path” between Pennsylvania Avenue and a side street. Image from Google Street View. While the Pennsylvania Avenue project is primarily an effort to address safety concerns along a notorious section of road, it could make walking and biking in this area a lot easier and safer with help from some additional projects. 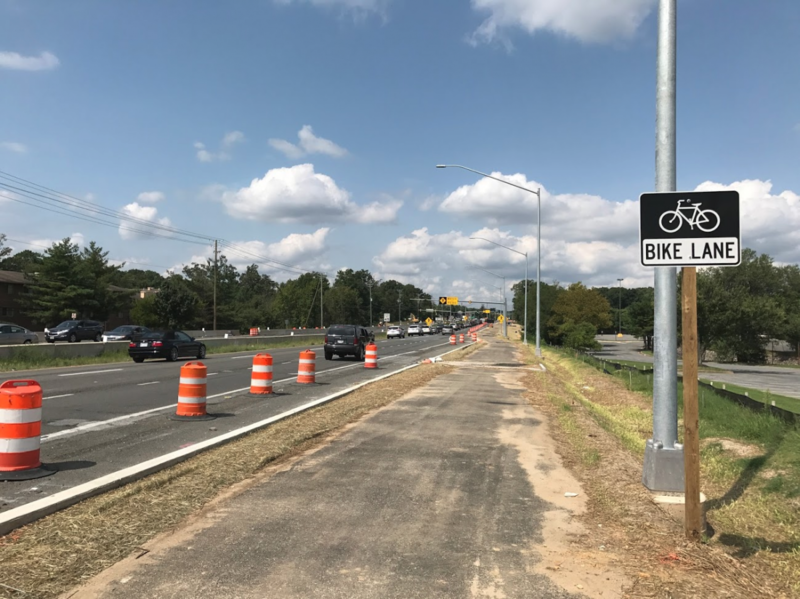 The new sidewalk and trail will terminate at Silver Hill Road, less than a mile away from the proposed Suitland Road bike lanes and sidewalks, which would run north to the DC line and connect to the District’s bike lane network. Adding protected bike lanes to Silver Hill Road, in addition to the Suitland Road project, would stitch together a seamless, dedicated bike and pedestrian spine running five miles from the DC line almost to the Beltway, with a Metro connection at Suitland to boot. 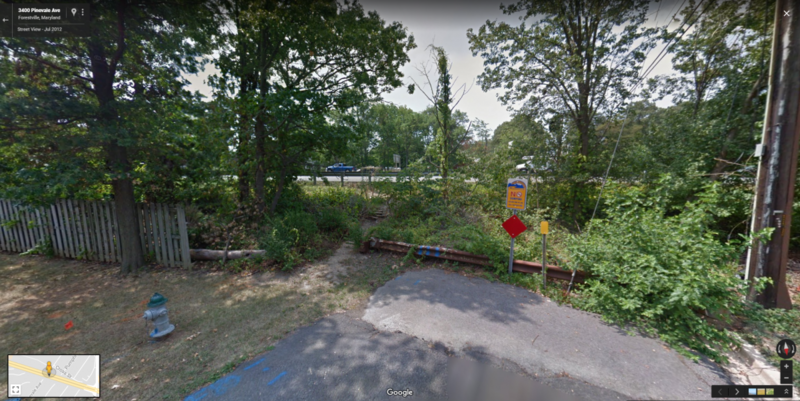 How proposed bike lanes on Suitland Road can connect this trail to a bigger bike network. Image by Google Street View used with permission. Such a “spine” wouldn’t transform auto-oriented Suitland, District Heights, and Forestville overnight. But it would bring shopping centers, schools, and bus stops within safe, comfortable walking or biking range from many neighborhoods. It could also guide future development in the area towards pedestrian-oriented design. Prince George’s County is already betting big on a new mixed-use development near the Suitland Metro station. A network of bike- and pedestrian-friendly streets feeding into it would be a great complement. Either way, this project will be a dramatic improvement for Pennsylvania Avenue and a meaningful step toward a more walkable, bikeable Prince George’s County. Drew Ackermann is a Prince George's County native living in Northeast DC with his wife and two kids. He is a graduate of the University of Washington's Master of Sustainable Transportation program and spends too much time playing Mini Metro.